There is a general difference between public and private query. As the name suggests, public query is available for everyone whereas private query can be used by the person who created it. But there could be a scenario, where you want to transfer private query of one user to another. This could happen when someone left the job or one simply wants to share their private query with another user. There are several ways to do it. Create a copy of the private query and assign to another user. Here is how to do it. 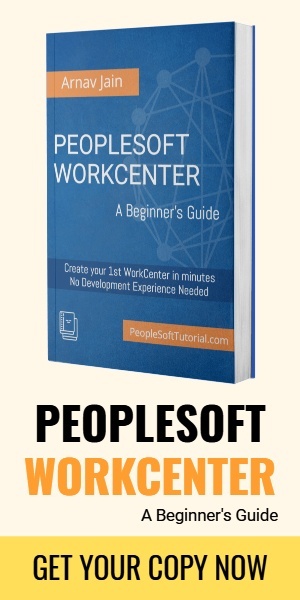 Use script to update entries in PeopleSoft query tables to change the owner of private query. Here are the steps. Transfer private ps query from one user to another via Query Administration. This post shows you how to do this. You will be required to enter the name of new owner id. Enter the user id and click Ok. If the target user already has another private query with the same name, you will get message similar to below. In this case, you may want to rename the query before transferring to the target user. If private query name is unique for the target user, then after you click ‘OK” query will be transferred and new owner will have access to private query. Keep in mind that original owner of the ps query will no longer have access to the private query. 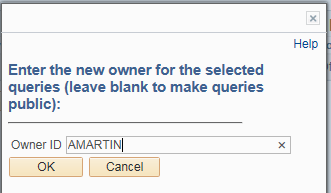 Also new owner must have access to records used in the ps query. This may require update to query security. If you simply want to share a copy of private query with another user, use this copy ps query option instead. How to use Trees as filter criteria in PS Query?